Quite the day on the “coaches retiring” front. Both Malta’s Scott King and Dillon’s Terry Thomas have decided to step away from their head football-coaching gigs, we learned. The two coaches are two of the most decorated in state history. You can read my story here on the two. Both coaches lost their respective state championship games this year, while Thomas’s team won it all in 2011. King, who will continue as the principal and athletic director at Malta, said he told his players Thursday morning. With daughter Sarah living in Bismarck and daughter Jill recently married and living in Albuquerque, King no doubt wants to have some more of his time freed up as his daughters begin families of their own. King said both daughters were able to attend his final game as head coach, a loss in the state B title game to Missoula Loyola. King said Malta has a number of strong players coming back and he feels like he is leaving the program strong. Thomas was a former star athlete in the Electric City and coached the Great Falls Sparkies baseball team while he was in college. He will continue to coach the Beavers’ basketball team. 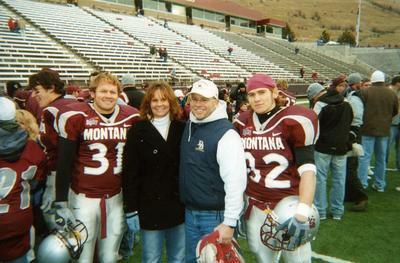 It’s worth noting that Thomas played for current University of Montana head football coach Mick Delaney at GFH. It came full circle when Thomas coached Delaney’s grandsons, Alex and Matt Basile as Dillon Beavers. Both Thomas and King feel blessed to have been so successful for so long.